Send a Union Message with every check you write! to vendors, customers and everyone in the bank check processing system! 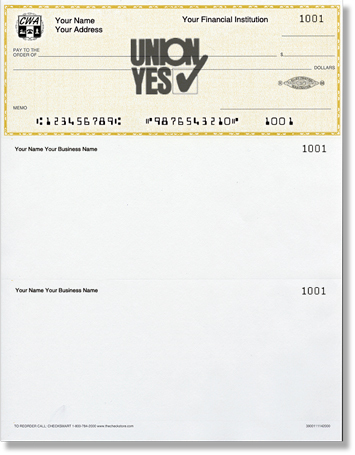 Every check has your International Union Logo printed right in front of your name & address. your International Union Logo, or a Custom Logo. Our laser checks are guaranteed to work with any desktop printer and any financial software. Order Union Made Laser/Inkjet Checks Now! Our laser/inkjet computer checks are designed to work efficiently with your laser or inkjet printer. We use the highest quality laser paper and specially formulated fuser ink to produce your checks. Laser/inkjets computer checks available in formats listed above, guaranteed to match your software. Available in Blue, Green, Red, and Gold, (colored stock now comes with state-of-the-art security features)! All orders printed and shipped within three weeks. B03, B04, and B05 Screened Image Logos available on all check styles at no additional cost. For custom logos, see order form.